After capturing a gold medal at the Vancouver Olympic Games -- the USA's first four-man bobsled gold in the past 62 years -- the U.S. Bobsled and Skeleton Federation (USBSF) is getting more aggressive with its sponsor branding. The USBSF says it plans to start emulating NASCAR and other motor sports by covering sleds with the logos of its top sponsors. In the past, simple "USA" designs were prominently featured. Federation CEO Darrin Steele felt it was time to takes things to the next level. 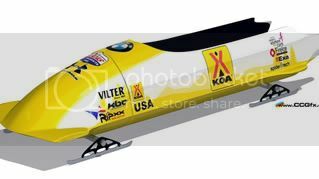 "Much like auto racing, sponsorship is the lifeblood of bobsled racing," Steele said. "We decided that branding the sleds like racecars would be the best way to get the most exposure for the wonderful companies that keep us going as we compete in World Cup competition and gear up for the next Olympic Games in Sochi, Russia." A total of seven USA bobsleds will be blanketed with their own sponsor specific themes and logos in New York. Sleds for USBSF sponsors BMW, Under Armour, Vilter Manufacturing, KOA campgrounds, Whelen Engineering, and two partner charities: Susan G. Komen for the Cure and Autism Speaks will be wrapped and ready to go at this weekend's FIBT World Cup event in Lake Placid, N.Y. Geiger Media developed the look of each of the themed sleds and track the exposure they'll get around the world. "Working to our benefit is the fact these athletes compete in a rather large apparatus, which affords us the chance to brand these things in big way," Geiger said. "We're taking the same basic principles that have worked for us in racing and applying them to the bobsleds, athletes, and support personnel. It's an incredible opportunity for companies to get involved, and being a 501c3, there are even tax benefits. Most of all, it really feels good to help out the young men and women who do this for nothing more than a love of country." Aside from the United States, where competitions are shown on NBC Universal, Federation officials say the sport reaches Canada, Germany, Switzerland, Italy, France, Russia, Poland, England, Scotland, Ireland, Wales, Spain, Poland, Latvia, Austria, The Netherlands, Belgium, Finland, Denmark, Sweden, Norway, and more than 50 nations in Africa, the Caribbean, and Oceania. "We first realized the potential of wrapping the sleds after we partnered with Geoff Bodine and the Bo-Dyn Bobsled Project, which provides our team with sleds" Steele said. "Geoff comes from NASCAR and has dealt with corporate sponsors for years and each year he has a fundraiser race between NASCAR and NHRA drivers where he's branded the sleds for the TV program. It's taken off from there. Geoff's proven to be a valuable asset to us well beyond providing us with the best sleds in the world." The 2010-2011 schedule includes stops in Vancouver, Calgary, Salt Lake City, Lake Placid, Igls, Austria, St. Moritz, Switzerland, Cesana, Italy, and Winterberg and Königssee, Germany. "We're hopeful this new exposure and the follow-up tracking we do will attract new sponsors to the sport," Steele said. "I know when Corporate America looks at our cost structure and Return On Investment numbers it will become obvious that our sport is not only very affordable, but well worth the investment."